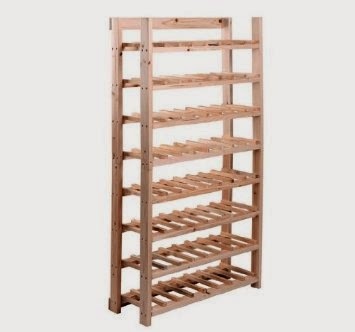 A couple months ago I blogged about my Shoe Storage Bench that I built out of pallets and mentioned at the end of the post that I would be starting a new project, building a wine rack. Well I am happy to say the wine rack is finished! It was a pretty easy project and I think any beginning builder can build this rack. The wine rack features 14 shelves and holds 98+ bottles. Here is my little DIY on how you can make this same wine rack. To start the rack, build the frame of the shelves. Take two 1″x3″x12″ boards and screw them to two 1″x2″x32″ boards. You should end up with a rectangle frame like below. (Note: There are two screws in each corner. Each shelf should have 8 screws in it for stability.) Now repeat this step 13 more times! The choice is up to you, but my examples below show what I did on the majority of my wine racks, which means 3 inches apart, having each shelf hold 7 bottles of wine. Start out by screwing the first wine separator to the shelf frame. The separator should start on the inside of the 1″x3″x12″ board. Now to make this step go faster, I cut a 3 inch board to be a spacer between my separators. I also made a stick that went the width of the shelf showing where each separator should be placed. Eventually you will have each of the separators installed and ready to go. I worked very hard on putting these rack together and it became an evening project to watch tv, drink a glass of wine, and assemble a few racks each night. Doesn’t that sound wonderful? Have a glass of wine while building a wine rack? Well, it sounds great until that point where you accidentally drop your drill on your thumb! So kids, the lesson we learned is power tools and alcohol do not mix! 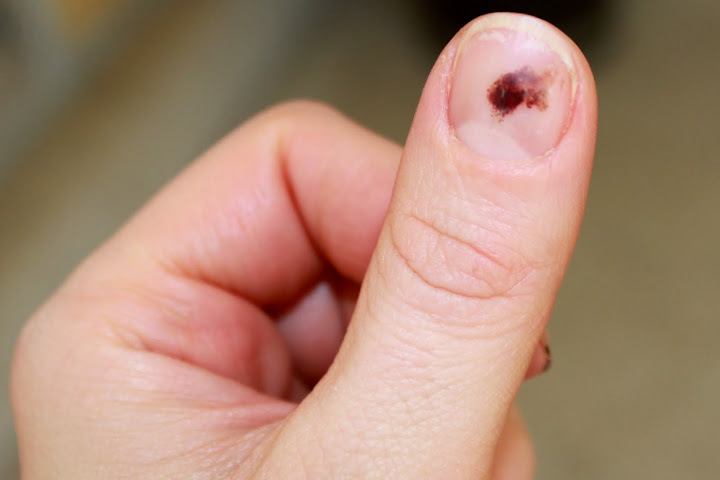 By the way, I smashed my thumb almost two months ago and the picture above is what it looks like now. I would have showed you the before, but it was a pretty bloody mess so I thought I would spare you. Maybe by summer the bruise will grow out! Other than the injury, I finally finished all 14 shelves. After all the shelves were completed, I decided to stain them all a dark cherry that pretty matches all my other furniture in the house. Now comes the difficult part, assembling the wine rack. You will most likely require a helper, and my husband was so kind to help me out. We laid the wine rack on it’s side and placed the 1″x3″x72″ boards on the backside of the racks. (Take note, we started with the back first incase we made any errors while screwing it together.) We decided each rack needed to be 6 inches apart and began screwing the racks in place. The screws should run through the 1″x3″x72″ board into the bottom of the shelf (the 1″x3″x12″ board.) Once all are attached on the back, flip it over and start with the front. It is very important when you are assembling the rack that you make sure all shelves are attached level both front and back and side to side. This will prevent any bottles from falling off the rack. We decided to put the rack up in our utility room, out of the way of a certain little boy that might want to try climbing it. Wherever you decided to place the rack, your floor might not be level so use shims to level out the rack. Again, this will to prevent bottles from falling off the rack and the wine rack from falling over. In addition to the shims, we also screwed the rack to the wall to prevent it from falling over. I am pretty sure 100 bottles of wine would REALLY hurt if it fell on someone! Some of the shelves are holding empty bottles, but hopefully we get a new batch of wine brewing soon so we can replace them with full bottles. I hope this DIY project inspired some of you new to woodworking to get out there and try it for yourself. Like I say a lot in this blog– If I can do it, you can do it! Happy building! Nice work Beth! You forever amaze me! I probably will never get into woodworking, but you do a fantastic job. 🙂 Our wine rack only holds 24 bottles…and I can't even keep that filled. Greta, you just need to start making your own wine! We are starting a Malbec soon! Yummy!!! Thanks! We love it and use it all the time. We started to stack bottle on bottles and it's holding strong! You didn't mention the size of the nails that you used? Any idea? That looks awesome i am going to try it and make one half the size as well to make an L shape. I am afraid if you use thinner wood it might make it hard to support the bottles. We have enough space between our racks that I actually stack bottles on bottles! i'm more then half way done. prestained, done all the cuts. half the screws. thinking of polyurethane after assembly. expect more then %10 of bottle separaters to split even with predrilling. ( could be the quality of wood.) also, to late now, but I would have preferred separating the bottle separators by 3 1/4''. not just 3 ''. How Sturdy is the middle when you have them full of wine. Does it bow much? Thanks Christopher for your comments. Our bottles seem to fit pretty good but I think I liked them sort of sitting on the wood rack. And Zen, we have had no problems with the rack bowing. I actually have bottles stacked on bottles. (We like to make too much wine.) Also, make sure to bolt it to the wall so no one will pull it over on them! I am not much of a woodworker but I think I am able to complete this project, I am going to start by making a smaller version of this rack. My question is (and this will show my ignorance) I cannot seem to find 1 x 1 lumber for the bottle holders, are these 1 x 2's which the actual size is 3/4" x 1 1/2" or did you actually find 1 x 1's? Hey mark…same here. Never bread of 1×1's. They have some true 1×1 square dowel rods but get your wallet lol. We are using the 1×2's or going to rip a 1×4 down on a table saw. Or use 1x2s and lose a bottle due to,spacing. Sorry about not responding to the 1"x1" question. I just purchased them at our local Menards. I didn't have them specialty cut down or anything and honestly I don't remember the price being too expensive. Maybe you can just take a 1"x2"and rip it down your table saw? Just make sure you use your push stick! Thanks for checking out the blog and email me with any more questions. Mine is still standing great in our basement holding our new batch of Malbec! I love the idea of using these wooden racks! Where do people find these materials though? We adapted your plan a little bit and ended up with a rack that holds 80 bottles and is 36" wide and lowest rack is a foot off the ground (I hate to bend over). LOVE IT! Wish I could figure out how to insert a picture of our finished rack. Planning to do a second one for the rest of our stock, and also do one for our daughter. Very nice looking rack. I will build one myself with some modification. What type of wood did you use? I love finding things like this because I like to keep a lot of my storage around me. Trying to math out the shelves. Lots of pieces of wood cut but who else used 32 inch shelves and then 1×2 spacers and what was the amount of space between the spacers?? Would I be better with wider spaces or narrower? I measured out 4 spaces of 2.5" and 2 spaces of 3". Will the 2.5 be too small? Perhaps I need to recut the front and back pieces so the math matches….HELP!! I've got to get this wine off my dining room table!! We used 2.5 and 3.5" but did have to space one out with bottles to see how it would look taking the uprights into consideration. We ended up using lots of wood reclaimed off the side of the road/ home renovation projects and ripping the wood on a table saw. We also used a bar glass rack type system at the top to hang our glasses on so it looks like a minibar— when then bloomed into plans for a liquor holder/dispenser/minibar.